Since 1977, THON has raised over $157 million for Four Diamonds at Penn State Children’s Hospital, providing comprehensive care for 4,000 families and funding critical research to take this fight beyond central Pennsylvania and spread hope around the world. We work year-round to provide both financial and emotional support for our families, ensuring that they never have to face cancer alone. Our year-long efforts culminate in a 46-hour, no-sitting, no-sleeping dance marathon each February to celebrate our survivors, remember those we’ve lost, and take a stand--all in hopes of one day dancing in celebration of a cure. Gino Pezzone and I have been working tirelessly all year with the hopes of being selected to dance in THON 2019. Independent Dancer Couples are dedicated individuals who set up their own fundraisers throughout the year, and with the support of friends and family, will obtain tickets in a lottery system in the hopes of earning a spot as dancers in the Penn State Dance Marathon. With your contribution, you will bring Gino and I one step closer to being able to take a stand against childhood cancer during THON Weekend 2019. 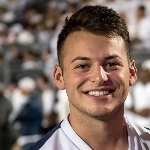 I first became involved with THON my freshman year of college through the Penn State Cheerleading Team. We were paired with the Miller-Smith Family, who’s son Quinn beat cancer in 2014. I instantly fell in love with everything THON had to offer. I jumped right into being involved with the family and attending THON events, leading up to my first ever THON in 2016 where I stood in the stands to support our 3 dancers who stood the entire 46 hours to represent the cheer team. After that first THON I knew I wanted to be more involved, so I spent my sophomore and junior years working on the Rules and Regulations and Dancer Relations committees. We worked year round preparing for those amazing 46 hours where all the magic would come together and we would support all the dancers standing up against pediatric cancer. As someone who has experienced the horrors of cancer in my family first hand, I am fortunate enough to say my mom is now a 10 year survivor, and as a result THON has become something I am extremely passionate about. Getting the opportunity to dance in THON 2019 would be the chance of a lifetime for both my dancer partner, Gino Pezzone, and myself. I THON for my mom. I THON for every child going through pediatric cancer and their families dealing with the pain associated. I THON for more tomorrows. I THON For The Kids. Please join Gino and I in our fight against pediatric cancer and the chance to dance in THON 2019. Every donation, no matter the amount, brings us one step closer to finding a cure. FTK always.